These days, if you talk to anyone who is in search of work, you will hear the word ‘freelancing’ over and over again. Reading this article means that you already know, in general, what freelancing is. It is not uncommon in this day and age to become a freelancer. A research conducted by Forbes revealed that by 2020, almost 50% workforce of the US will become freelancers. Freelancing will become more attractive in the days to come, even more than it is today. More and more people, worldwide, are moving towards self-employment and it is unlikely that the number of the independent workforce's will stop to increase anytime soon. So, it is safe to say that getting into freelancing early on is a SMART move. Do you really think freelancing is for you? Because the conjecture that surrounds freelancing is vastly different than the reality of freelancing. 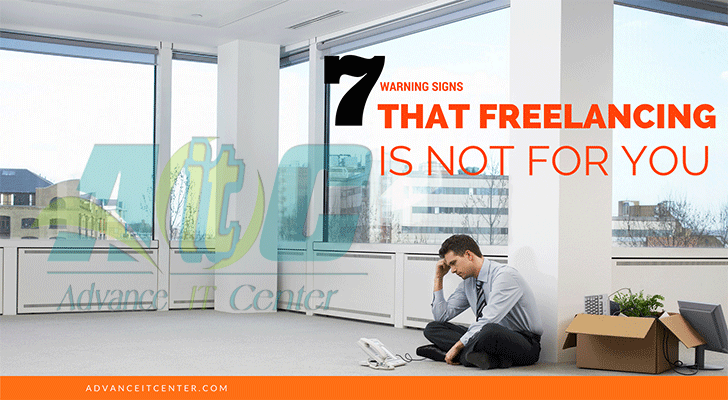 Here are 7 warning signs that freelancing is NOT for you. Finding mentors when you want to get into the freelancing is a very good idea. But if you have searched for mentors then chances are you have heard that a few month classes can give you access to jobs that pay more than $400 or $500 per month. Or, that you can have any job to your liking and you would be swimming in a great number of clients. If these are what you expect, then you would do better without getting into freelancing, Period. These are classic advertisement tactics that lure you to take classes that would set you up for disappointment. Manage your expectations before you get into something you don’t clearly know about, because only then can you have a future in freelancing. Because it really does have a fruitful future. The main source of Income or an Alternative??? Before you start to freelance, you should first understand the reality of freelancing. If you are a student and need day to day money for little expenses, then by all means, freelancing can be a good source of income. But, if you are in need of a real job, then starting to freelance will not be the best of ideas. Don’t get me wrong though, there is a lot of money in freelancing. But that will not be the case when you just begin to freelance. In the first couple of months, be ready to do jobs that pay very little if you are in it for the long run. The long hours of hard work will pay off in the future. This will be the case if you have a safety net. You will see that people who have prior knowledge about freelancing have enough money behind them to cover a few months of expenses to start up their freelancing career. The low earning jobs will not help you cover expenses, especially if you have a family to support. In short, the starting months would see you working a lot more than you normally would as an employee but earn a lot less. Being assertive will take you a long way when freelancing. So, if you are not self-confident then freelancing is definitely not for you. There is a number of reasons for this, you have to constantly be in contact with your clients and pick calls from strangers, you cannot be discouraged when you get low paying jobs and more importantly, you have to be able to say NO. Being a people-pleaser will not help you at all. If you keep saying yes to all the offers you receive then you will eventually wear down. This will cause the quality of your work to decrease considerably and your reputation will take a hit. You also have to be very confident of your skills, clients can easily spot your insecurity a mile away. It will show in the way you communicate, how you speak and write. Think like a client, would you want a job done by someone who is not confident of his skills? It may just be that the person is shy, but it also can be the case that he is insecure because the job is not within his skill set. Then there is the fact that you will face moments when your clients leave you. If this happens, you will need to find new clients, which is never easy. You will also have clients who will be unwilling to pay on time and in those cases you need to be assertive and ask for your pay. All these require a lot of self-confidence that you just cannot do without. Self-discipline is paramount if you get into freelancing, though it is also healthy to be so all the time. If you take a job, you CANNOT be late in completing it as that is a huge negative point on your plate. You need to get your work done. Being late can happen for a number of reasons. Being self-employed is a big factor here. When you can choose your own working hours, you get a huge advantage of choosing when to do the work, but with it, you also get all the distractions of your home life, being in a working environment and at home will affect your mood in different ways, it is easy to be dedicated in an office where you are constantly evaluated by your seniors. At home, you have a relaxed environment where no one is there to pressure you to work, and so it is easy to lose yourself to less important stuff which is more fun than a task. So, if you are not dedicated, you will just not be able to get your works done in time. Everyone has something that they do very well and prefer to do only those things that they excel at. If this is you, then freelancing is most certainly not for you. You need to be willing to do multiple tasks in order to become a freelancer and if this frustrates you, then you are just not cut out for it. Remember, freelancing means that you are self-employed while being under someone else’s employment you do a specific part of a big job, but as a freelancer, you do the entire thing. This requires you to actually interact with your clients, keep track of other jobs and their deadlines, payment order of the jobs that are done and of course, revising all the works you have completed. There are many people who relish being tasked with a single job, while many prefer a more diverse approach. What kind are you? You will find that a successful freelancer is highly driven to commitment. They do not give in to fear and frustration, which exists in every person but in different amounts. Your ability to overcome your fears is key to success, it is common to be scared of starting something that you have never done before but it is another thing to let fear win and not be able to do anything. This way, you will never succeed as fear will never let you progress. Establishing yourself as a freelancing will require you to fix yourself a subject that people will find you for. Being an expert will increase your appeal a lot and will bring in a lot of clients. You will see that every successful freelancer has one theme that they excel at, be it writing, translating or being an expert in a programming language. These people spend a lot of time honing their skills and that is exactly the reason why every work they do becomes gold. This allows them to set a very high rate of wage per hour and not lose clients. M. Gladwell, in his best-selling book, “Outliers” argues that it requires approximately 10,000 hours on a person’s part to be an expert in any field. That is a very long time. Remember, being an expert on a particular topic is better than being a jack of all trades and master of none, as clients require nothing less than mastery from you. These are 7 very important factors that you need to consider before you start to freelance. Because if you have problems with the points mentioned above then freelancing is going to bring about a lot of suffering for you. How so? Because a lot of freelancers have already faced all these issues in one way or another. But they did overcome all of them. So in the end, it is you who must decide whether you are strong enough to overcome your shortcoming or give into them.